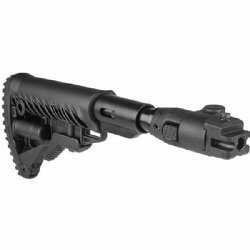 Fab Defense M4-AK P SB Shock Absorbing Buttstock replaces your AKM OEM stock with an M16/M4 collapsible / side-folding stock. Clever recoil reducing shock absorber is embedded into the M4 buffer tube. This reduces felt recoil and increases shot to shot recovery. This is a light weight, strong and durable replacement stock for your stamped receiver AK. Design is tough and robust.